On August 12, 1939, Southern Pacific's crack streamliner, the City of San Francisco, derailed near Harney, Nevada, killing 24 people and injuring 121. Of those hurt, 32 required hospitalization. A coroner's jury and a railroad hearing board (is this the fox guarding the hen house?) 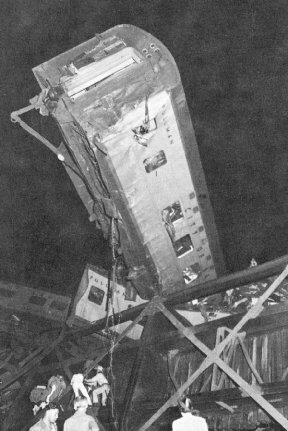 both determined that the accident was caused by sabotage - the deliberate moving of a rail to cause derailment. This is a fairly straightforward solution. Whoa, there! Although this disaster happened more than six decades ago, doubt still exists in the minds of many area old timers. Some believe it was a railroad cover-up while others accept the sabotage scenario. Neither side strays from their opinion. Luxury describes the streamliner promoted as the fastest, most powerful ever designed and built. Its time from Chicago to the west coast was less than forty hours. Almost a quarter of a mile long, it was powered by six giant engines generating a monstrous 5,400 horsepower to pull the train's 1,207,151 pounds. The City of San Francisco symbolized the ultimate in safety engineering. Following behind the power units were cars emblazoned with San Francisco landmarks: Market Street, Presidio, Mission Dolores, Nob Hill, Embarcadero, Twin Peaks, Fisherman's Wharf, Chinatown, Gold Gate Park, Union Square, Seal Rocks, Telegraph Hill, and Portsmouth Square. With comfort and speed it could carry up to 220 people - the crew and 171 passengers. Although jointly owned by Southern Pacific, Union Pacific, and Chicago Northwestern, I am using SP since the accident happened on their tracks. Engineer Ed Hecox, a 20-year SP veteran, was at the controls. Pulling out of Carlin, Nevada he noted the train was 26 minutes behind schedule. He told the fireman they would arrive on time at Oakland because he could throttle up to 90 miles an hour across Nevada. F.S. Foote, Jr., a passenger, said the train was hitting the curves uncomfortably after they left Carlin. He added that two bottles of beer were thrown from their edged table onto the floor. A woman was hurled from her seat into the aisle and everyone laughed. This was a few minutes before the derailment. The train was, most certainly, going faster than it had on previous legs of the journey. It was 9:33 p.m. when Hecox said he saw a tumbleweed on the tracks as the train approached Bridge Number Four. He felt the unit lurch, then jump the tracks out of control. The train traveled almost nine hundred feet before grinding to a halt. Five cars dropped into the Humboldt River and three more went off the tracks and down an embankment. Hecox: "As the engine stopped, I ran back. All I could hear was the screams and moans of the injured and dying. Everywhere there was dust. I could not see a single living person." He then ran down the tracks to Harney, about one and one-half miles away. After making emergency telephone calls, he returned to the site with the Beowawe section crew. Joe Bell, an Elko barber, then 11 years old, was one of the first on the scene. He came with his father and the Beowawe constable. They heard pounding and found the section crew under a car moving a rail. It was later claimed that the men were moving rails back in place to get the last four cars back on the tracks to move survivors out. What survivors? Why wasn't the crew rescuing passengers instead of repairing track? Many of those headed for the hospital weren't taken to Elko until the morning on special trains made up in Carlin. In the next few hours the accident scene was filled with volunteers helping rescue efforts and those who came just to look at the tragedy. This totally contaminated the area so that no real clues could be found. A few people even picked up souvenirs to take home. During the investigation, divers recovered tools from the Humboldt River and a couple of jackets were found in the area. Railroad detectives maintained they were dropped by the saboteurs. Shady characters, 26 of them, were arrested, questioned and released. Several confessed but were written off as nut cases. Thousands were questioned in the following months but no was ever charged. The railroad conducted hearing only added to the confusion by clearing the railroad of all wrongdoing. Some claim they did this to head off future lawsuits. Intelligent, knowledgeable people decided, after hearing the railroad's evidence, that there was no doubt about the accident being caused by a moved rail. Newspaper reporters were barred from the hearing. They could do things like that then but the journalists still bitterly complained. An Elko newspaper photographer was accused by the railroad of taking pictures from an angle which made the wreck look worse than it was. He commented, "God knows, it would have been impossible to make it look worse than it was." Foote and other passengers claimed that the streamliner was traveling very fast. A sheriff and a constable both said they could not find any evidence of rail tampering. The FBI disagreed with the hearing decision. Those who testified at the hearings were mostly railroad employees and residents of railroad towns. Jobs could have been lost if they charged the railroad with negligence. If someone had been arrested, charged, and convicted, perhaps the controversy would not still exist. There will always suspicion and doubt about the cause. Foote was eventually paid $7,500 which almost covered his out of pocket hospital expenses. The SP refunded his full extra fare price - five dollars, the amount he paid for traveling on the City of San Francisco. The letter noted that the company technically only had to refund the value of the unused portion but they were refunding the full amount due to the interruption of their service. They did not give back his regular ticket price. Sources: "Recalling a Train Wreck" by Howard Hickson, Northeastern Nevada Historical Society Quarterly (80-1) and "City of San Francisco Wreck" by F.S. Foote, Jr., Northeastern Nevada Historical Society Quarterly (90-1). These publications are, of course, much more complete than the extreme condensed version in this story. Quarterlies are available in the Museum Store of the Northeastern Nevada Museum, Elko. Photographs from the archives of the Museum. ©Copyright 2002 by Howard Hickson. Permission to use is given but, if any portion or all of this article is quoted, proper credit must be given.